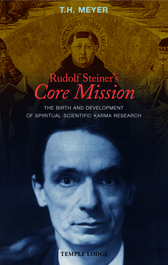 Rudolf Steiner's core mission, repeatedly delayed due to the incapacity of colleagues, was to pursue contemporary spiritual-scientific research into the phenomena of reincarnation and karma. This stimulating book describes the winding biographical path this mission took, and in particular focuses on the mystery of Rudolf Steiner's connection with the influential medieval philosopher and theologian, Thomas Aquinas. Utilizing numerous archival sources and publications, Thomas Meyer reveals many facts relating to Steiner's core mission, and shows the critical roles played by Wilhelm Anton Neumann and Karl Julius Schröer in its genesis and development.